In a large heavy pot or Dutch oven, heat oil over medium heat. When oil shimmers, add onion and bell pepper; cook, stirring occasionally, until softened, about 3 to 5 minutes. Stir in potato, garlic, chili powder, cumin, coriander, oregano and salt; cook for 1 minute. Add chipotle, tomatoes and their juice, and broth; bring to a boil. Reduce heat, cover, and simmer for 20 minutes. Stir in beans and simmer until potatoes are fully cooked, another 8 to 10 minutes. Serve topped with avocado, sour cream, scallions and lime wedges. 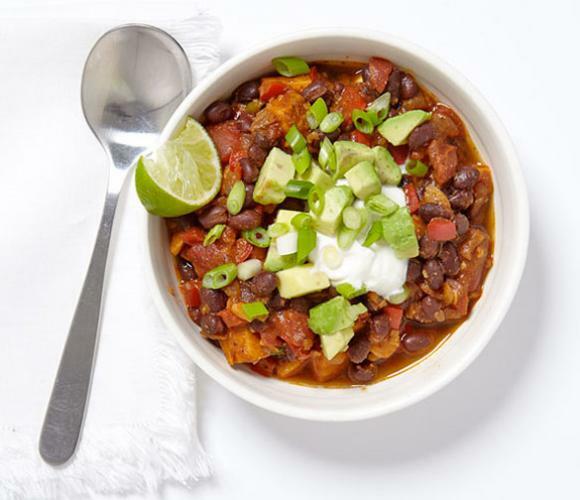 Serving size: about 1 1/2 c chili, 2 Tbsp avocado, and 1 Tbsp sour cream per serving.